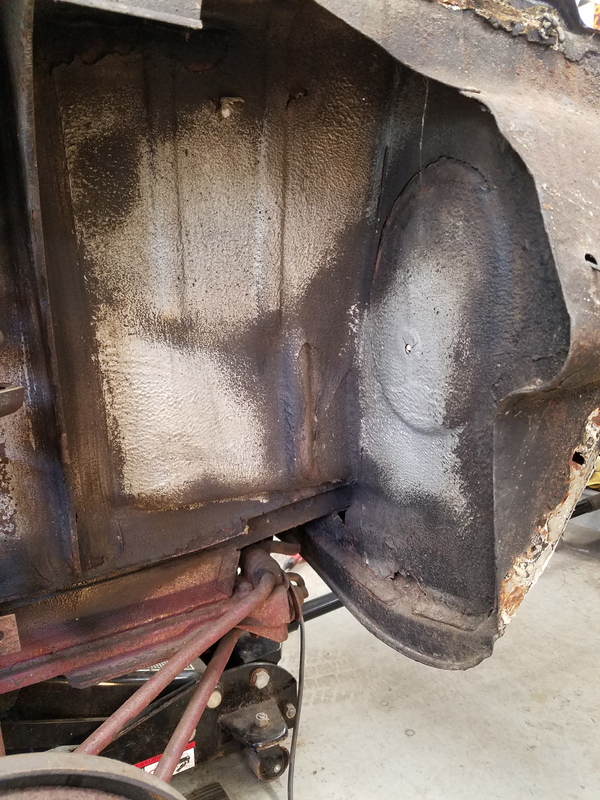 Fenders, rust and trim, oh my! I was away for several weeks and if you must know, played quite a bit of golf. 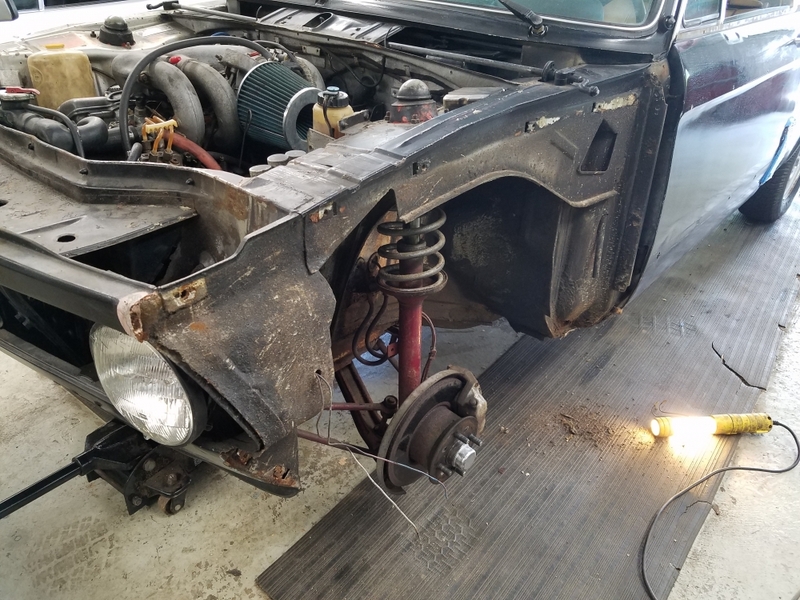 But I've been back for a week now, so I got to work doing what needs to be done over the course of the following weeks to get it ready for the body shop, rust repair and paint. If you ever want to know why paint jobs cost so much money, try tearing a car down. It takes an incredible amount of time (and patience) and when I run out of the latter, I just call it a day and go back at it another time. I actually got a lot done, at least IMHO. First up was that trim at the bottom of the door windows. Touchy stuff, but I managed without ruining it. Also removed the rear windows and associated trim, discovering that bottom trim portion is riveted. It came right up with a small knife, but will need to be drilled out and replaced with screws down the road. Rear windows were a piece of cake. Not so the headlights. The four integral screws virtually snapped right off the bat; every one of them. So I'll be drilling them out as well and replacing with stainless nuts and bolts. Those bastards fought me pretty hard. Got the hood off no sweat with the help of my son (scribed the hinges beforehand). Roundels pulled right off. Tail lights no sweat either. This car is pretty simple and everything is out in the open, at least so far. Even managed to pry off the aluminum windshield surrounds without damage, so I'll be reusing those hopefully. Got the trunk latch and lock off...easy, after I search this forum how! Then I tackled the door latches, outside handle, strikers and mechanism. I can tell you I was nervous about these but other than it being dirty and greasy, it was very simple. I needed a little heat on two of the screws, but so what? I had it in my head to take pictures of all the various stickers and their locations, and then sprayed them down with some degreaser I had hanging around and went after them with a razor blade scraper. Miraculously, all but one came off almost whole. They were all sprayed black from one or more horrible paint jobs, but underneath exposed virgin Polaris Silver! Thar she blows!!! Took off the windshield wiper bottle and motor, nozzles and tubes. Removed the spent sunroof weatherstripping. 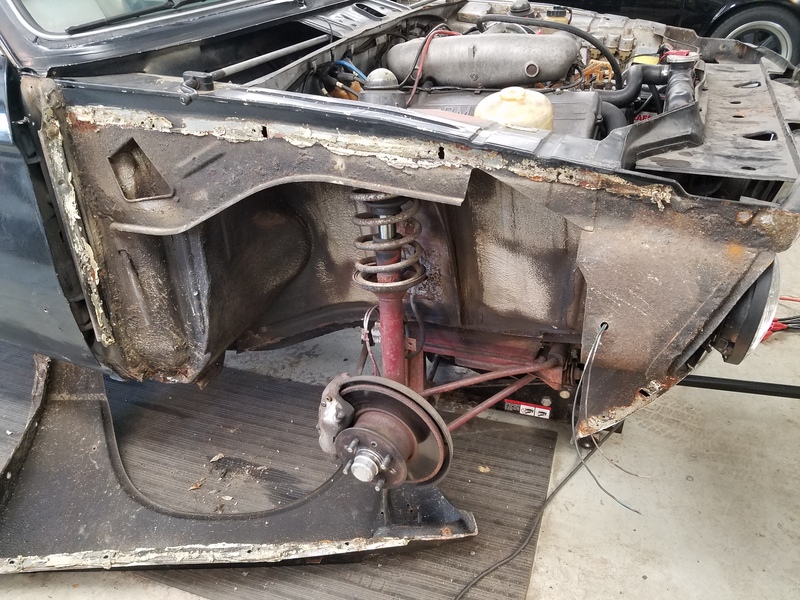 Took off all door, hood and trunk rubber. Took both fenders off as well, as they're getting replaced (rust). All in all, I got a lot done for not that many hours of work. 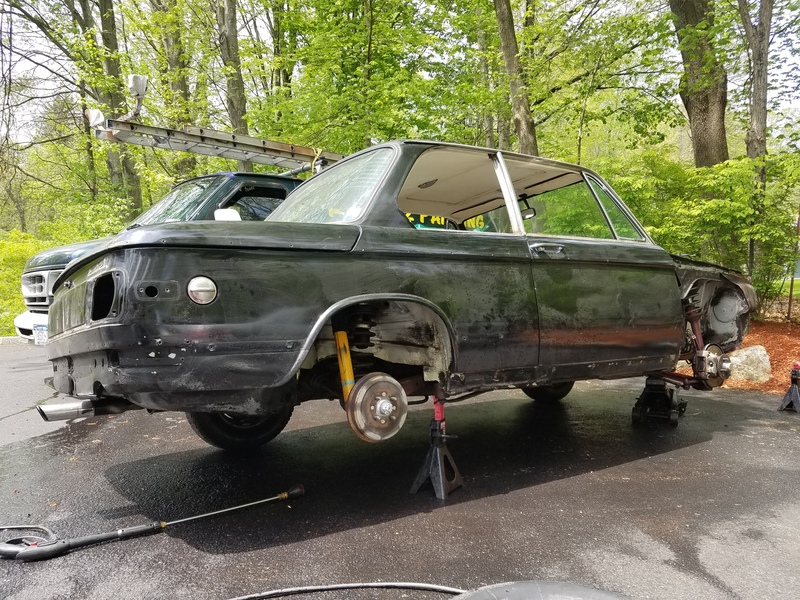 Yesterday I took the car out on my driveway, jacked it up on each side as high as I could, and degreased power washed the living daylights out of it. Then I backed it in to begin the final stage of subframe and engine removal. Oh, did I mention I found some 5 1/2" wheels for sale? Drove up and bought them for a song, so now I have 5, 5"x13 with the correct date code for 1974, and 5, 5 1/2x13's to use. While there the seller handed me an unused rear end gasket set and an outdoor mirror as a parting gift, since he had no use for them. Wow, nice score! Oh, I almost forgot the most important thing! I contacted the second owner through receipts I had found inside the car. He verified that the car was in fact Polaris Silver with a Light Brown interior, even though all known Polaris Silver Tii's came with blue interiors. This is very exciting, as I now own the only 'known' Polaris Silver Tii with a interior color other than silver! Woo-hoo! Here are some pix. More to follow. Doesn't look too bad so far! You got a pretty clean one to work with.